Has Ola set the stage for taxi consolidation? CarDekho, the Ratan Tata-backed automotive classified listing app, has raised about $65 million and is trying to take its product to other emerging markets, too. CultureAlley's app to learn English has been downloaded by 33 million users. In March 2015, RazorPay became the second India-focused start-up to be selected for a programme by Y Combinator, an American seed fund that mentors and invests in early-stage start-ups. LogicRoots develops interactive games that help kids boost mathematical skills. What's common between these start-ups? All are either based in Jaipur or were incubated here. While the four named have received funding and account for much of the limelight, 40 other start-ups are in the works in this city, famous for its forts, palaces and precious stones. What work in Jaipur's favour are lower costs, a good talent pool, better quality of life, and proximity to the Delhi National Capital Region. "I don't have to commute for an hour or two to reach work. Most people here don't commute more than 10-15 minutes. There's peace of mind; life is stress-free. Unlike the metros, there's no rat race here. People are good, there's closeness and depth in relationships, which helps you bond," says Amit Jain, chief executive and co-founder of CarDekho, which helps people buy old and new cars. It is backed by venture capital firm Sequoia Capital and hedge funds Tybourne and Hillhouse. "Start-up costs in Jaipur are much lower than in Mumbai or Bengaluru," says Kunal Gandhi, founder of LogicRoots. Start-ups say operational costs here could well be half or a third of those in major metros due to lower rentals, lower cost of living and low attrition. According to a large start-up, salaries in Jaipur could be 30 per cent lower than in metros due to lower costs, though most start-ups say they pay salaries comparable to what engineers earn in Mumbai or Bengaluru. Jaipur is home to many engineering colleges, which ensure a steady flow of talent. Besides, about 30 per cent of those securing admission in the Indian Institutes of Technology (IITs) are either from Rajasthan or have studied at Kota, a hub for students preparing for IIT entrance exams, estimates CultureAlley's Nishant Patni. Some of these students want to return to the state if salaries are competitive, says Tarin Poddar, 21, chief executive and co-founder of Street Jumper, an on-demand delivery service. Start-ups say getting fresh and mid-level talent isn't a problem, attracting senior people is. "Getting seniors is difficult, as they are unwilling to relocate," says Jain of CarDekho. LogicRoots, for instance, is opening a development office in Mumbai with 23 people, as not everyone is willing to shift to Jaipur. RazorPay, incubated at Jaipur, shifted to Bengaluru after going through the Y Combinator programme. Entrepreneurship is fostered here. "People here are open to entrepreneurship; taking risks is not considered a taboo, it is celebrated. Failure is not scary," says CultureAlley's Pranshu Patni. When Nishant and Pranshu were thinking of launching a venture, their families encouraged them. The fact that many come from business families helps foster entrepreneurship. The nature of a start-up's work also plays a role. "Most start-ups here are consumer internet firms, which don't need much high-end engineering work," says the founder of a start-up that is yet to raise funds. "Unless a start-up is doing high-end design work for which, say, there are only 100 people in the country, who are located elsewhere, they can continue to be in Jaipur," says LogicRoots' Gandhi. Founders also say if a start-up is involved in web designing and data entry, it can be based in Jaipur. Of Car Dekho's 1,800 employees, 1,300 are in Jaipur. These staff members do the bulk of the back-end work and man the company's call centre to serve car dealers and buyers. The company also has 200 employees in Gurgaon (through its acquisition of gaadi.com) and 100 in Hyderabad. To be sure, Jaipur isn't the only small town making news in the start-up world. Pune has seen some promising start-ups flourish. While Kochi's start-up village has helped technology firms, Chandigarh, Mysuru, and Hubli are also on the start-up map. The support system for start-ups here is evolving, with the state government and organisations such as The Indus Entrepreneurs (TiE) taking the lead in promoting these. In 2013, the Rajasthan State Industrial Development & Investment Corporation roped in Indian Institute of Management Ahmedabad's Centre for Innovation, Incubation & Entrepreneurship to set up Start-up Oasis to promote entrepreneurship. The initiative is being funded by the Union government's Department of Science & Technology. Start-up Oasis has incubated 39 start-ups, including Razor Pay. Of these, 15 have been launched, four have received funding and five-six are dormant. The Rajasthan Angel Investors Network (RAIN) has invested in four companies. 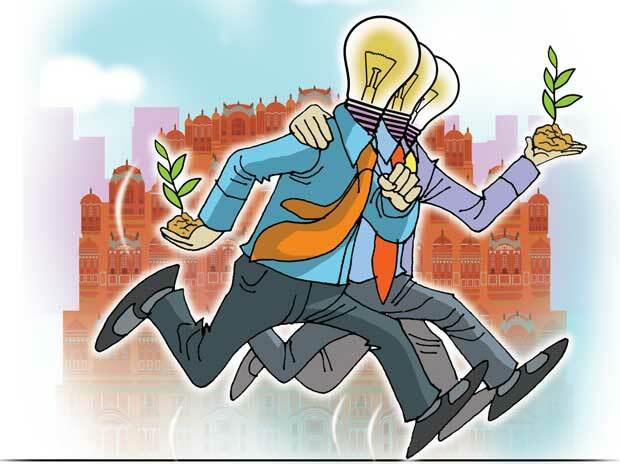 Start-up Oasis, TiE and RAIN are conducting an accelerator programme through which start-ups will be mentored for three months before RAIN invests Rs 15 lakh each in eight firms, for eight per cent stakes (TLabs invests Rs 25-30 lakh for a similar stake). So far, 20 ideas have been shortlisted from 156 applicants. Similarly, a boot camp is being planned for social enterprises in agriculture, education, health care and rural services. An accelerator for companies in water and sanitation will pitch these before investors and the government. These start-ups, along with eight winners from the accelerator programme, will be able to pitch their products before investors at the Jaipur Start-up Summit on October 8-9. The October event is likely to be attended by IDG Ventures, Lead Angels, Unitus Seed Fund and Villgro. While Unitus has appointed Start-up Oasis as its Rajasthan partner, Villgro will hold one of its eight events in the country in Jaipur. It seems unlikely that others will join the league of CarDekho, CultureAlley, RazorPay and LogicRoots (all of which have received venture capital) soon. But observers say start-up activity has picked up pace here, with 40-50 start-ups actively working. Chintan Bakshi, chief operating officer, Start-up Oasis, feels at least four-five start-ups have the teams and business models to scale-up and receive angel funding soon. There are other signs of a pick-up in activity, too: today, Headstarts, Oasis, TiE, Entrepreneur Cafe, and Think Space organise events catering exclusively to start-ups.